Figure 2. Track of Hurricane Erin. Figure 3. Hurricane Erin track (atl.ec.gc.ca). Hurricane Erin was the closest to NYC on 9/11/01. Why didn't we hear about this in the morning news? Note that Erin increased in strength as it approached Bermuda and passed by Bermuda. Yet, as Erin apprached Bermuda, the warnings were dropped to that of a "tropical storm." Source: Figure 4. Hurricane Erin track. Hurricane Erin was the closest to NYC on 9/11/01. Why didn't we hear about this in the morning news? Best track for Hurricane Erin, September 2001. Track during the extratropical stage is based on analyses from the NOAA Marine Prediction Center. Satellite image taken at 7:15 p.m. EDT. MIAMI, Florida (CNN) -- The first Atlantic hurricane of the season churned toward Bermuda Saturday night, with experts forecasting even stronger winds over the next 24 hours. Boasting maximum sustained winds at 85 mph and even more potent gusts, Hurricane Erin is moving north-northwest toward Bermuda. The island's government declared a hurricane warning -- up from a hurricane watch -- late Saturday. As of 11 p.m. EDT, an Air Force "hurricane watcher" plane placed Erin 325 miles southeast of Bermuda, but creeping closer at a rate of 15 mph. The storm's center could be over the island on Sunday or Sunday night, the National Weather Service said, dumping 5 to 10 inches of rain. Forecasters also warned the storm will be accompanied by avove normal tides and large, dangerous waves. Forecasters said Erin's hurricane-force winds extend outward up to 35 miles from its center, with tropical storm gusts blowing up to 145 miles out. The escalation to hurricane status represents the latest in Erin's up-and-down ride since it first appeared in the Atlantic last week. Just three days ago, the storm had dissipated to a tropical wave -- only to regain tropical storm status a few days later. Five storms have reached named status this hurricane season in the Atlantic, but Erin is the first to become a hurricane. All rode a roller coaster of strengthening and weakening as they plowed their way west. Meanwhile, a tropical depression that formed in the eastern Atlantic on Friday lost its form and weakened a day later. Tropical depression seven's maximum sustained winds were only 25 mph on Saturday evening, with gusts surging to 35 mph. The remnants of the storm, located about 750 miles west of the Cape Verde Islands, are moving westward at 16 mph. MIAMI, Florida (CNN) -- Hurricane Erin continued to gain strength Sunday but posed increasingly less threat to land as it strayed farther out in the Atlantic. The worst part of the storm, with maximum sustained winds of 120 mph (195 km/h), passed to the northeast of Bermuda on Sunday, according to the National Weather Service. At 11 p.m. EDT, the National Weather Service placed the large eye of Erin, the first hurricane of the 2001 Atlantic season, 115 miles (185 kilometers) northeast of Bermuda. The storm was moving north-northwest at 10 mph (17 km/h). As predicted, the storm -- upgraded earlier Sunday to a Category 3 hurricane on the Saffir-Simpson scale -- did not hit Bermuda directly. The island's government instituted a tropical storm warning Sunday night, down from a hurricane warning earlier in the day. The National Weather Service said the warning will likely be discontinued sometime Monday morning. Erin should cause above normal tides, large waves and tropical storm-force squalls in Bermuda through the night, forecasters said. But conditions on the island should improve over the next 12 hours as the system moves away. The National Weather Service said Erin's hurricane-force winds extended outward up to 45 miles (75 km) from its center, with tropical storm force winds extending to 175 miles (280 kilometers). The escalation to hurricane status Saturday represented the latest in Erin's up-and-down ride since it appeared in the Atlantic last week. Just four days ago the storm had dissipated to a tropical wave -- only to regain tropical storm status a few days later. Five storms have reached named status this hurricane season in the Atlantic, but Erin was the first to become a hurricane. All rode a roller coaster of strengthening and weakening as they plowed their way west. Figure 5. The yellow circle shows the location of Bermuda, as Hurricane Erin passes by. Figure 6. The yellow circle shows the location of Bermuda, as Hurricane Erin passes by. MIAMI, Florida (CNN) -- Hurricane Erin posed no immediate threat to land on Monday after grazing past Bermuda overnight and moving into the open Atlantic. Bermuda has discontinued its tropical storm warning. Reports from a U.S. National Hurricane Center (NOAA) research aircraft indicated that Erin had weakened slightly. The weather service said Erin's hurricane-force winds extended outward up to 45 miles (75 km) from its center, with tropical storm force winds extending to 175 miles (280 kilometers). The storm could still affect Canada around Newfoundland in three to four days, forecaster Brian Jarvinen of the NOAA told The Associated Press. At 5 p.m. EDT, the weather service placed the center of Erin, the first hurricane of the 2001 Atlantic season, 540 miles (875 kilometers) south of Yarmouth, Nova Scotia. The storm was moving north-northwest near 8 mph (13 km/h). The weather service said it expected Erin to gradually turn to the north Monday night, with only a slight weakening over the next 24 hours. The storm -- upgraded earlier Sunday to a Category 3 hurricane on the Saffir-Simpson scale -- did not hit Bermuda directly. The island's government instituted a tropical storm warning Sunday night, down from a hurricane warning earlier in the day. The weather service said the warning will likely be discontinued sometime later Monday. Five storms have reached named status this hurricane season in the Atlantic, but Erin was the first to become a hurricane. Figure 7. 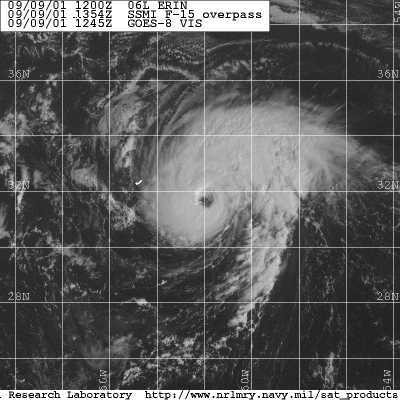 Hurricane Erin 9/10/01. MIAMI (AP) -- A weakening Hurricane Erin with top winds of 90 mph headed north Tuesday, away from the United States on an arching route also expected to spare Canada. However, Erin was still generating strong waves along the upper East Coast and forecasters said it could touch southern coastal areas of Newfoundland later in the week -- but only as a further weakened extra-tropical storm. Erin was downgraded overnight from a Category 2 to a Category 1 storm, on a scale of one to five. By 5 a.m. EDT, Erin was about 460 miles south of Yarmouth, Nova Scotia, and moving north at 7 mph. A gradual turn toward the northeast and a boost in forward speed was expected later, according to Stacy Stewart, hurricane specialist at the National Hurricane Center in Miami. "It'll move up into the north Atlantic, then probably end up in Greenland or Iceland, the graveyard of most Atlantic hurricanes if they don't move inland," Stewart said. "It's just a threat to shipping." Over the weekend, Erin skirted Bermuda, which sits about 560 miles off the North Carolina coast. No major damage or injuries were reported, though wind knocked trees onto power lines, and airlines canceled flights in and out of the island. Despite losing power, Erin still was capable of generating large swells along portions of the U.S. East Coast during the next several days, according to Stewart. He said no hurricane or tropical storm watches or warnings were posted, but cautioned authorities and residents of northern coastal areas to keep watching for rough seas. Source: Figure 10. Best track for Hurricane Erin, September 2001. Track during the extratropical stage is based on analyses from the NOAA Marine Prediction Center. The colored circles indicate the approximate area covered by the main body of the hurricane. This shows the potential danger this hurrcane posed on New York and the surrounding area. Figure 11. Hurricane Erin track (atl.ec.gc.ca). Hurricane Erin was the closest to NYC on 9/11/01. Why didn't we hear about this in the morning news? 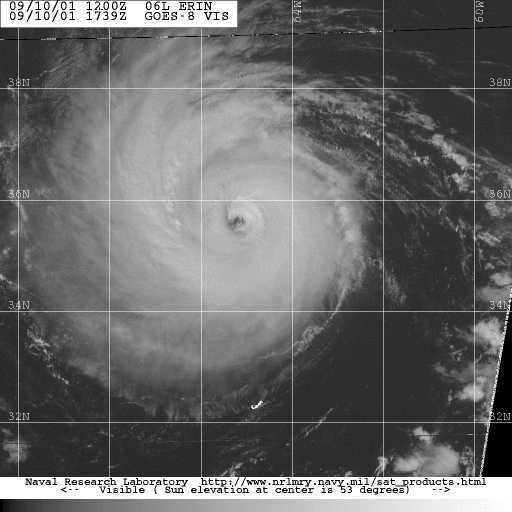 Note that Erin increased in strength as it approached Bermuda and passed by Bermuda. Yet, as Erin apprached Bermuda, the warnings were dropped to that of a "tropical storm." Source: Figure 12. Hurricane Erin track. Hurricane Erin was the closest to NYC on 9/11/01. Why didn't we hear about this in the morning news? Figure 13. Legend and distances for the figure on the right. Distances in miles. Figure 14. Path of Hurricane Erin and location on 9/11/01. The zone around the hurricane, shown in blue shading, is the expected region of field effects.